Advanced hydraulic technology allows lower oil flows than other hammers, thus achieving optimum excavator performance and reduced fuel consumption. We pride ourselves on the first-class after-sales service and support we offer all of our customers. You can be confident that once you own a Stelco hammer, one of our team will always be available to offer expert advice. All Stelco hammers from the SEL950(S) to SEL4000(S) are manufactured with internal lubrication ports for central greasing, using the Stelco ‘Advanced Internal Automatic Greasing System’. 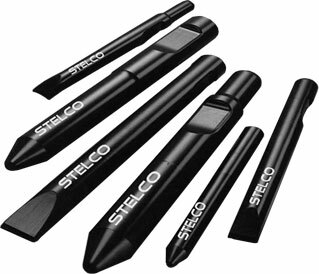 Stelco Europa Limited are based in the United Kingdom and has become a leading World-wide supplier of hydraulic hammers, tools and spare parts. Stelco manufacture a wide range of hydraulic hammers to suit excavators from 0.5 - 70 tonne and are constantly developing new products to maintain cutting edge technology in order to meet a demanding industry. Call us on 01246 56 99 77 Now. We are arguably the largest stockist of demolition tools in the UK & Europe, supplying the industry with tools to suit MONTABERT, ATLAS COPCO, FURUKAWA, KRUPP, INDECO, MSB, RAMMER, NPK, SOOSAN, HANWOO, PRODEM, DNB, STAR, TAKEUCHI + many more. All our tools are manufactured from the finest raw material and are subject to the very best state-of-the-art heat treatment process. This provides the customer with a tool which we are confident will meet the brutal demands of breaking rock. We are the UK’s leading supplier of hydraulic hammer spare parts. 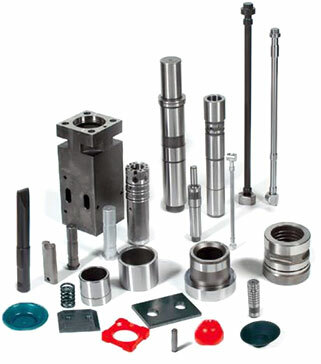 We have massive stocks of hammer spares to fit most brands of hydraulic rock breakers, wear bushes, pistons, tie rods, tool retainers, seal kits, diaphragms – we have them all! manufactured to the very highest standard and can usually be delivered the next day from order. Not only are our prices extremely competitive but we think we offer the best after sales service & technical support available. Call today with your enquiries – our advice is free! We will not be beaten on price! - FACT! From our UK based distribution center we can usually deliver your hydraulic hammer, tools or spare parts the very next day from order. We even offer a same-day service in the London area. With every hammer you will receive one of our comprehensive workshop manuals. 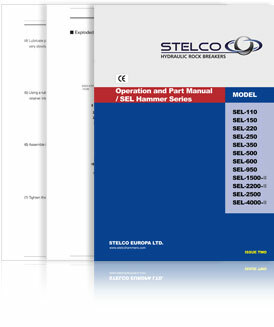 This provides both operators and service engineers everything they need to know to get the most out of your Stelco hammer.